The voicemail has become an inevitable part of the modern business trends. There are many companies and firms that have voicemail messages to greet their customers in case their officials are busy. In the past, people preferred to speak to actual individuals but the trend is gradually changing. Today, people are catching up with the new voicemail trend. 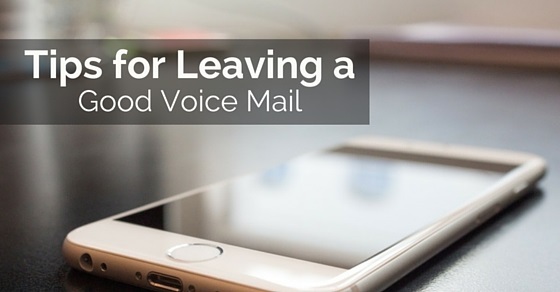 This makes it even more important to understand the best way to leave a voicemail message. You also need to understand the pros and cons of different messages you send through voicemail. While a voicemail message offers higher security, it also offers the opposite person a choice to cut the call before it is completed if he thinks it is insignificant. Hence you need to think well before leaving a voicemail message. Here are some simple tips and suggestions that may help you prepare an ideal voicemail message. A voicemail needs to be short and concise. No one is going through the entire voicemail if it is too long or boring. The ideal duration of a voicemail is 18 to 20 seconds. If you extend a voicemail beyond 25 seconds, there are greater chances that the person will keep the call before listening to the entire message. While the message has to be short, it does not mean you should increase the speed of the conversation. This does not help and in most cases the caller will not be able to comprehend what you said. You need to maintain an even tone ensuring that each word has been pronounced clearly. Another factor that impacts the quality of the voicemail or whether the purpose of the voicemail is served is the timing of the voicemail. You need to time the voicemail in such a manner that you are sure it will be received. If you place a voicemail at odd hours, there are very few chances that someone will receive the voicemail. The same is the case during office going hours. If you make a voice mail when someone is heading for office or leaving from the workplace, there are few chances that your message would be received or heard. If someone is travelling, he surely won’t be in a state to receive voicemail and grasp the message being conveyed through it. If you know the purpose of the message being conveyed in the voicemail, you should phrase your voicemail accordingly. If you are making a sales related voicemail and you want the person to call back, just leave as much information as may arouse the interest of the listener. You should also make it a point to leave your phone number along with the voicemail. This will ensure that the person will return your call before you call back. If it is a personal voicemail, make sure you convey where you are and when you can revert the call. This will help to convey the necessary message to the caller. A voice mail will fulfill its purpose only if the listener’s interest is aroused. Before you create your voicemail, take time to think what will arouse the caller’s inquisitiveness. Speak just as much is necessary. You also need to leave a number where the caller can get back. Make sure the number message is conveyed clearly. If necessary, you may repeat the number once in the beginning of the voicemail and once in the end. The message you leave in the voicemail decides the future of your interaction with the person. There are some things you need to mention in the voicemail while there are certain other things you need to strictly omit. Here are some things you should never mention in a voicemail message. You may be tempted to leave your email id or website link in the voicemail if you have called regarding sales or any other business. This is actually a foolish move. If you provide your email address, they can choose to simply mail and revert. This means you lose an opportunity to directly communicate and an email can never create the same impact. Similarly, if you provide your website address, the caller gets all the vital information on the website itself. He does not see the need of calling you back and talking to you. A long voice mail is almost always boring and annoying. Long voicemails usually make the mistake of getting to the subject very late and by then the caller loses all the interest in the call. On the contrary, if you greet the caller and brief him about the topic while leaving some doubts and curiosity, he will call you back to get his doubts cleared. This call will act as your door of opportunity. Keeping the message concise and yet conveying the necessary message is truly an art. Very few people manage to do this successfully. Remember that if you write the voicemail message in a hurry, there are few chances of you wording it properly in few words. So you need to take ample time to prepare a good voicemail message. When someone hears the same message over and over again, he loses his interest on the message. That is the reason why you need to strictly avoid template messages. It is always better to prepare your own message. You also need to make sure that you do not use the same voicemail message twice for the same person. This is particularly vital if it is a business or sales call because here the profit depends completely on their interest. You may prepare a set of voicemail messages for different types of requirements or needs. You must also make sure you do not use the standard voicemail introductions for business or sales voicemail messages. Try to come up with an introduction that is interesting and yet unique. In a voicemail message, your voice governs the interest of the individual. Hence, create voicemail messages in proper voice. In case of business related calls, appoint a person who has a bold and clear voice. Avoid individuals who fumble or stammer while speaking. An authoritative tone can help during business related voicemails. In such cases, people tend to take the voicemail messages seriously. The accent of the person leaving the voicemail message may also matter. If the accent of the person leaving the message is same as the speaker, it creates a personal feel that helps the conversation. If you are working at a position where you may have to leave voicemail to international clients, you may have to specially train yourself on different accents. This can help you send satisfactory voicemails to clients around the world. Clarity is an important aspect that defines the effectiveness of a voicemail message. The wordings of the voicemail should be simple so that the listener understands exactly what you wish to convey. Clarity in tone also matters. A clear tone means that what you say would be clearly heard by the listener. Clarity also means that the message should maintain its focus. Do not try to convey several things in one voicemail message. Understand what you actually want to convey and make that, the subject of your voicemail. A clear voicemail message without any disturbances can help your business progress. It is not easy to leave a perfect voicemail in your very first go. You need to practice to make sure you perfect the art. This needs to be done especially in a profession where you may encounter a similar task frequently. You can refer different websites or mobile phone devices to understand exactly how a voicemail message is written. Once you have worded your voicemail perfectly, you can now start practising it. You may use a mobile phone to record the voicemail and then hear it out. Gauge it through the listener’s perspective. Try to see if any improvements are possible. Once you make the necessary changes, save the new voicemail message and repeat the process again. This way you will end up with the perfect voicemail that will be extremely effective and will fulfil its purpose. A voicemail is a truly effective tool to attain your goals. If a voicemail is created effectively after keeping all the above points in mind, there are really no chances that it will misfire. There are chances that technical issues could reduce the effectiveness of a voicemail. It is thus best to ensure that the voicemail is sent properly and clearly through mobile gadgets. Individuals who fail to understand the best way to create a voicemail do not get true benefit from the voicemail. Therefore they do not realise the significance of this tool in modern day marketing and sales. Previous articleUsing Spell Check on Your Resume: Is that Enough? How to Come Up With Interesting Conversation Topics?